You can't argue with a color combo from nature: sunny yellow and sky blue. Or at least that was my excuse for pairing these bold brights. 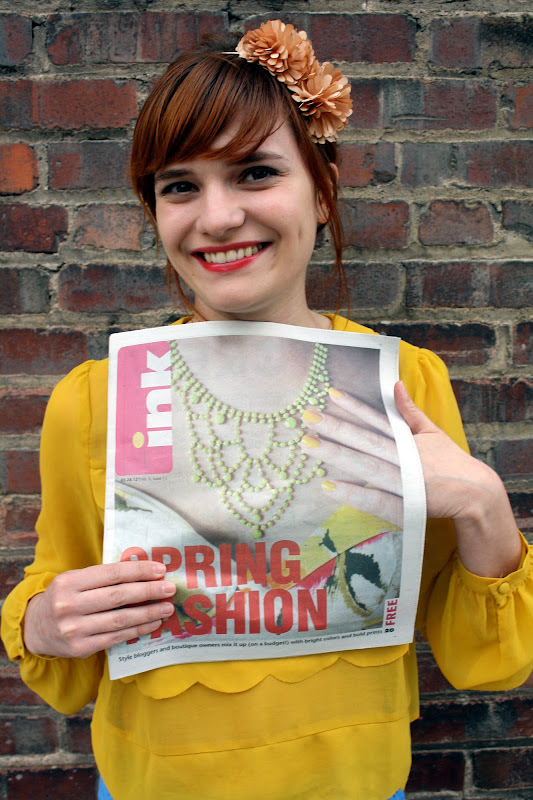 The latest issue of Ink features some spring fashion inspiration from local bloggers and boutique owners including yours truly. My co-worker snapped a clever pic of the cover on her phone that I thought I'd recreate for the blog. This outfit makes me happy! I love these colors! these colors are just SO beautiful and happy. i adore this outfit. Adore that top. You always wear colours so well! This outfit makes me want to do cartwheels! You look so good...might be my favorite outfit on your blog, ever. Loving it! Beautiful! Love the combination of the top and pants with the shoes. Lovely color combination and I've got shoe envy like crazy. Absolutely divine use of color. And gorgeous shoes. :) Cheers. Your hair is fab here!! AWESOME outfit! I love these colors together! So pretty and happy! I LOVE that mustard blouse, it's suc ha stand-alone piece with the lovely detailing and pretty colour! so cute! this feels like what modern snow white would wear, no? okay, you've been killing it lately! who am i kidding, you've always been killing it. but i've just been so drawn to your posts as of late. keep it up! I love this!! These colors are so bright and pretty and they look beautiful together. It's such a happy looking outfit and you look super cute in it too. The color combo is awesome! And I am loving the shirt and the shoes. I adore th mustard shirt! its so pretty with the littel scalloped edges!